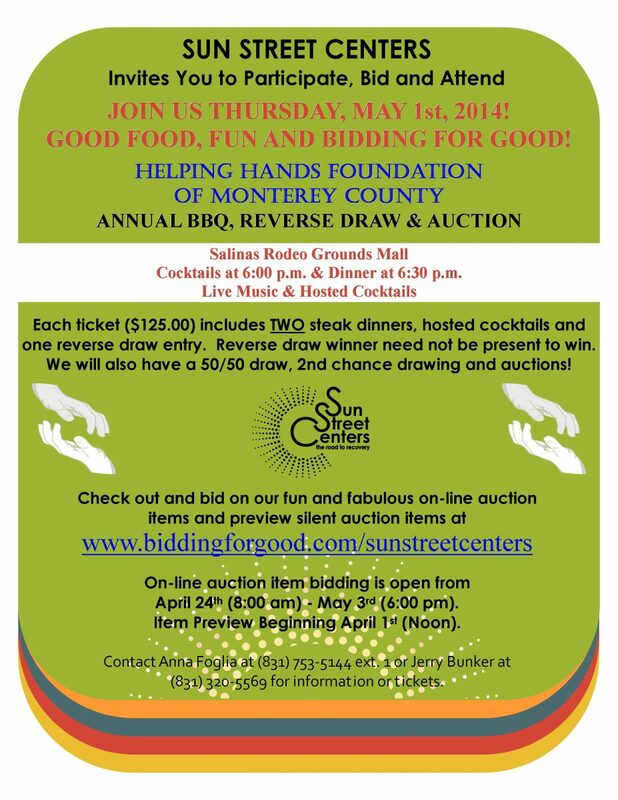 Join us for good food and fun at the Helping Hands Annual BBQ and Reverse Draw! Live Music & Hosted Cocktails! Each ticket ($125) includes TWO steak dinners, hosted cocktails and one reverse draw entry. There will be a 50/50 draw, 2nd chance drawing and live auction to benefit the Helping Hands Foundation of Monterey County. 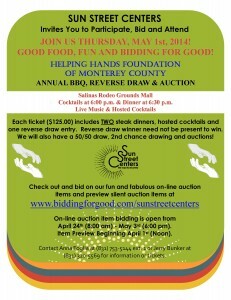 There will also be a silent auction and NEW online auction at biddingforgood.com/sunstreetcenters to benefit Sun Street Centers. For more information or tickets please call Jerry Bunker at 320-5569 or Anna Foglia at 753-5144×1. Airshow Salinas – A must for fans of daring flight maneuvers and airplane acrobatics. Ariel Theatrical – Watch the acting talent of Salinas youth aged 3-12 as they perform classic plays as well as popular musicals and recitals. Tailgate Basket – The perfect companion for the viewing of your favorite football team on a Sunday night with your buddies. “Honey Do” basket (girl) – Who says only men can hold a hammer?! “Honey Do” basket (guy) – Cross off a few of your to dos around the house…. Date Night Basket – Enjoy a date night in style with this assortment of Monterey Peninsula favorites. Family Fun Basket – Ditch the remote and spend some quality time with your loved ones with this action-filled assortment. Bath and Body Works Basket – Turn your bathtub into a spa with this assortment of luxurious creams, soaps and gels. California Rodeo – Awake your inner cowboy as you watch the horse show and the taming of bulls at the Salinas Rodeo. Blair Estates – Bring wine tasting to your home with this assortment of Blair Estate Wines and matching glasses. Central Coast Fly Fishing – Teach your child the joys of fishing with this all-inclusive packet. Crush Consignment – The finishing touch for your next date night outfit. Need matching earrings? The gift card will take care of that. First Awakenings – The perfect place to take your mother for a brunch this Mother’s Day! Grower’s Pub – Enjoy a delicious lunch or dinner at this historic Salinas establishment. Jesse Beer Photography – Beautiful and vibrant landscape photography. Lalla Bar and Grill/Del Monte – The perfect place to grab a bite before heading to the movies. Artist Lesley Anne Spowart – Dress up your walls with these beautiful abstract paintings. Weekend stay at a private Lake Nacimiento home – Have you ever wondered how those fancy homes by Lake Nacimiento look like from the inside? Now you can see for yourself! McShane’s Nursery – Plant this rose tree in remembrance of a special event or individual. Monterey Plaza Hotel/Schooners – Enjoy a romantic dinner with stunning views of the Monterey Bay. Rancho Canada Golf – Step into Tiger’s footsteps as you play a round of golf with your friends. Shelly by the Sea Gift Basket– Guaranteed to send you to bubble heaven…. The Fish Hopper – Just the place to go if you love fish and like to catch a glimpse of the beautiful Monterey Bay. Whole Enchilada Marketplace – Stock up your fridge with tasty goodies from local produce companies. Zeph’s One Stop – Enjoy a variety of over 30 local wines in a relaxed and fun atmosphere. Seaside Garden Center – Make your yard a required stop for local birds with this beautiful birdbath and succulents.